Prepaid entire sent from Havana via New York to London on board Ocean Line's "Washington" on 21st February 1848. 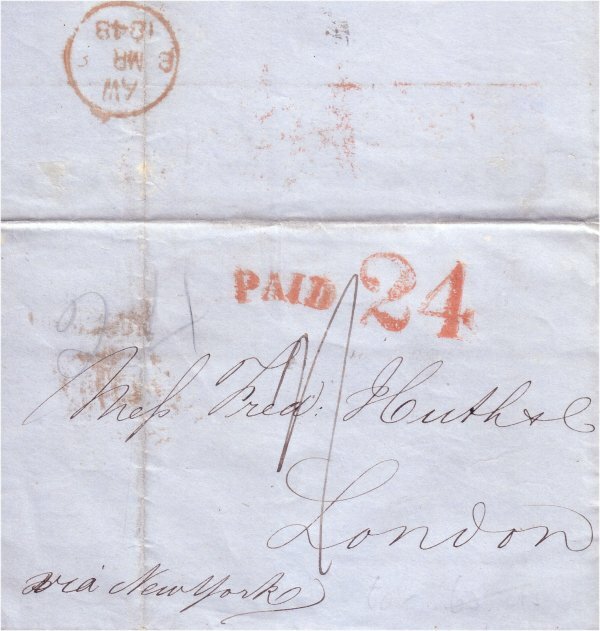 Postage paid in US: 24¢, '24' red hand stamp and 'PAID' applied at New York. Postage due in GB: 1/- per ½ oz, in manuscript. The GB packet fee of 1/- for the first half ounce was introduced 10th January 1840. The discriminatory 1/- fee was charged by the British Post Office as a packet fee as if carried by Cunard ships.